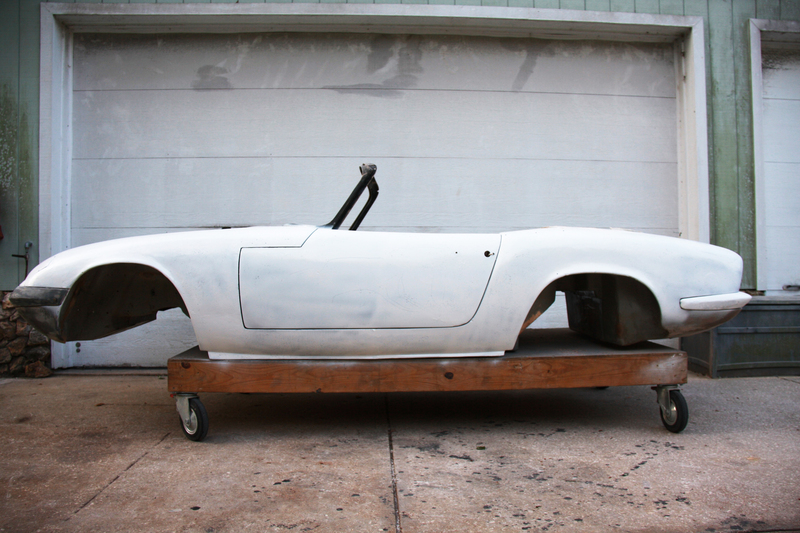 With the body pieced back together and the fiberglass work all done on our project Lotus Elan, the next step is to smooth out the fiberglass repairs and apply gelcoat. While fiberglass is a fantastic material to both build a car’s body out of and then repair it, there are a couple of basic rules that you must follow. 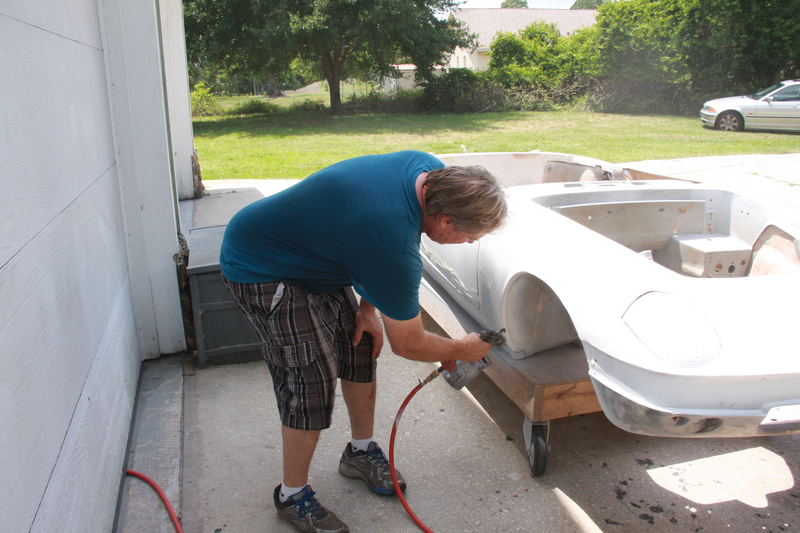 Rule number one: A layer of gelcoat must cover the porous fiberglass car’s body before any Bondo, primer or paint goes on the car. Gelcoat is an epoxy or polyester resin, depending on who sells it. It’s generally colored and then placed in the mold before the fiberglass is laid into the mold. In our case, we would need to spray or brush gelcoat over the whole car before we could proceed with the final body sculpting. We smoothed the fiberglass repair on each panel to a close approximation of how we wanted the final car to look, then brushed or sprayed on the gelcoat. Only after this was completed could we begin final bodywork. What size gun tip, what was the viscosity, and what line pressure did you use for the gel coat? We have a C3 Vette that needs to be blasted down to the original fiberglass and will need a new gel coat before the minor body work can begin. Also have a sun baked dune buggy that severely needs a re-surface. If not sprayed, but rather brushed on, is the gel coat soft enough yet strong enough to take machine sanding to remove the brush marks and inevitable runs/sags on the horizontal panels? Thanks for any help or information that you can share. We used a standard cheap primer gun and reduced the Gelcoat by about 10% with Styrene. The stuff goes on relatively smoothly, and is difficult to sand, but it can be done. Talk to / share with the material supplier the fact that it is going to be applied on a male surface (a repair) , and not being applied in a female mold. Stock off-the-shelf gel coat is formulated to NOT cure completely until oxygen starved by the laminate applied over it (guaranteeing it is chemically bonded, co-cured together). The supplier will provide some "surfacing agent" to add during catalyst mix, a liquid wax additive (simplified description) that floats to surface after spraying, makes a film that effectively seals the gel coat, allowing it to cure completely. All that is true of polyester gel coats. Epoxy version is called surface coat, is nowhere near as common (the lotus and dune bug are certainly polyester based, based on age and cost). While single panel on the vette is one thing, in terms of the dune buggy, most would just epoxy prime and paint it overall, instead of going back to gel coat. Thanks for the information guys, HUGE help ! ! ! Did a test spot on the Vette, a taped off chemical strip, the re-paint is close to 1/16" thick ! It's going to take some aggressive blasting/sanding and will surely need a good gel coat afterwards.